I seem to have one major flaw with my stitching, besides it taking 12 years to finish an 8x10 design because I got distracted by lint, I never seem to get the finishing completed. Either the delicate stitching to assemble a box or scissors case or framing, when I finally do get things done they gather somewhere and collect dust. Since we moved west I have been looking for an affordable framer only to be met with quotes of near $500 for a relatively small piece, I've framed one myself but finding a ready made frame deep enough for the fabric to be stretched isn't always easy either. The local Joanne's was having a super sale on framing so I decided it was time to give them a try, they didn't disappoint which was a nice change from the locations in Michigan. Went with an orange from her dress for the primary mat to bring out the color, conveniently it also goes well with the colors in the house so she can stay up all year. With the beading either a spacer or a second mat was needed so I went with green to draw off the wings being the lightest color for a bit of balance. 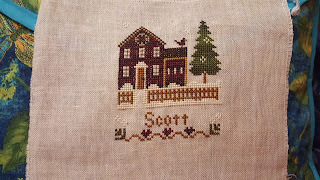 After seeing how well the framer they have does with needlework I'm now a bit more motivated to take a few more of my projects in for some finishing. 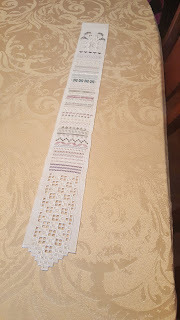 If nothing else the hardanger should really throw them for a loop, perhaps I should get on making that one a bell pull like I was planning to from the start.